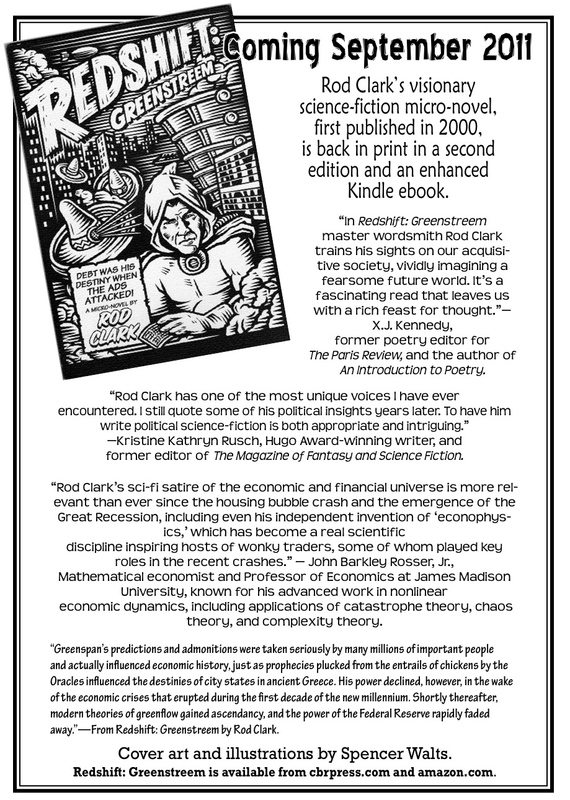 Cambridge’s CBR Press has just reissued the short, punchy and funny sci-fi “micro-novel” Redshift: Greenstreem by Cambridge resident Rod Clark. First published in 2000, it’s an unapologetically geeky piece of futuristic sci-fi set in 2093 Los Angeles, in a world where what we quaintly refer to as “the 99 percent” have been enslaved by debt and inflation. These consumer drones inhabit “Redshift,” an area where their whimsical desires, fanned by a constant stream of advertising, can be transformed against their will into binding agreements to purchase. Redshift presents a satirically exaggerated dystopia, but one that pointedly resembles our own here and now. Wonky appendices hark back to other sci-fi classics like 1984 and A Clockwork Orange, but Redshift is more intent—if only slightly—on tickling your funnybone than giving you nightmares. Rod Clark joined us this morning for coffee and a recording session. 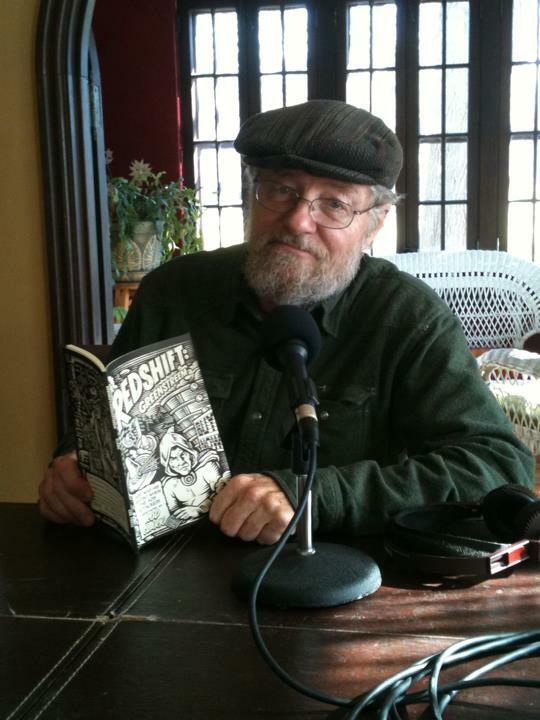 Listen as Rod shares a young boy’s perilous shopping adventure from his sci-fi micro-novel Redshift: Greenstreem. 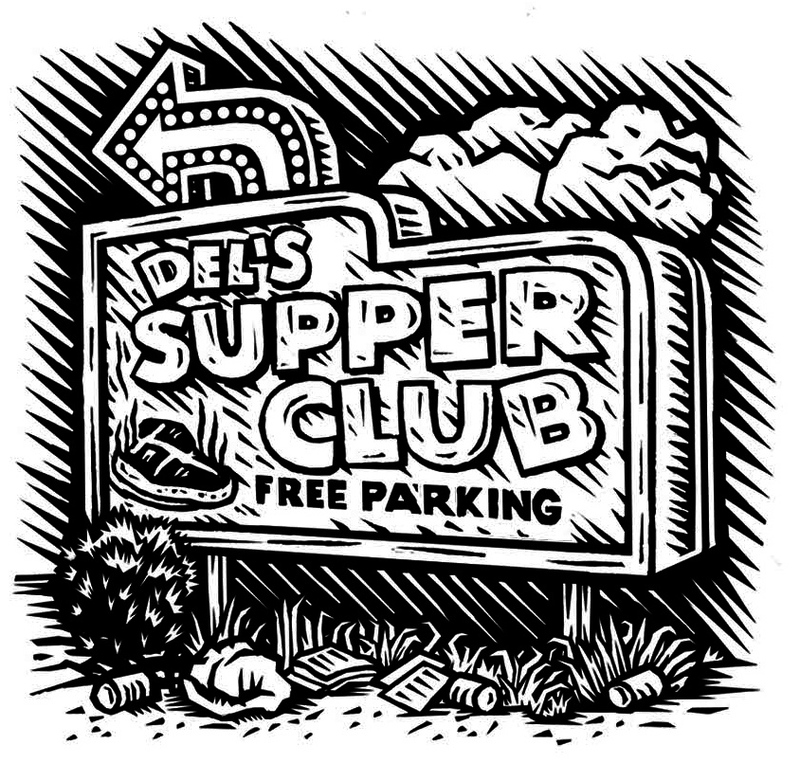 First published by CBR Press in 2000, Rod’s dystopian tale of hyperinflation and grocery store products that stalk customers like prey, feels more real and scarier than ever. 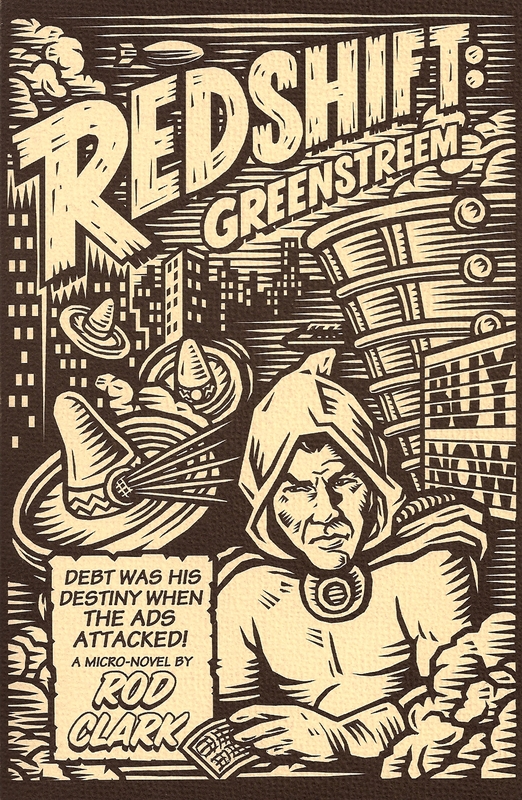 Redshift: Greenstreem is now available in a 2011 second-printing, and as a Kindle ebook. Jem had never been in a “real” store before, and the store knew a rookie customer when it saw one. As he slid his goggles to his forehead to see clearly in the gloom, the glittering tiles lit up beneath his feet, and a thousand soft hooks reached for his eyes. Rainbows of choice wove radiant tentacles about him! How could the severe Saver exchange malls wreathed in black crepe have ever prepared him for this? JUST KEEP MOVING, KEEP MOVING, DON’T LET YOUR EYE REST ANYWHERE, he told himself, walking firmly down the aisle toward the seemingly distant and unreachable counter. But the dreams were stacked so thick and bright on the shelves; it hurt not to reach out and touch them. Bright bottles of soda with their implicit promise of fun-filled romps with laughing girls, menthol cigarettes pitched by tinnily singing penguins holostitched on the cartons. KEEP MOVING! JUST KEEP MOVING!, he thought. But narcotic lollipops in myriad flavors leaned toward him like flowers toward a rare beam of sun. Bottles of cheap gin and mescal featuring skimpily clad sirens of several genders invited him to an afternoon of debauchery, cheap blue packets of cockroach editing software gave confident promise of virtual pest control, and rows of laundry soaps emanated their sweet and sickly perfumes, strangling him softly in a paradise of fluffy towels and sun-drenched sheets. The lemon yellows and sweet purples of the packagings made him dream of synthetic blossoms—lawns of artificial grass, fanned by a climate-controlled breeze under a fluorescent sun. Meadows of cool, quick, sweet feeling spread in front of him, lands where true joy and real pain were equally impossible—landscapes looking into sunlit kitchens that were somehow everybody’s kitchens, full of always happy faces and endless platefuls of the world’s most delicious waffles. Mmm! Looked pretty tasty—especially the frozen ones with the pink bunny doing somersaults on the box, and perhaps … NO! NO! JUST WALK TO THE COUNTER! LOOK AT NOTHING! TOUCH NOTHING! FEEL NOTHING! 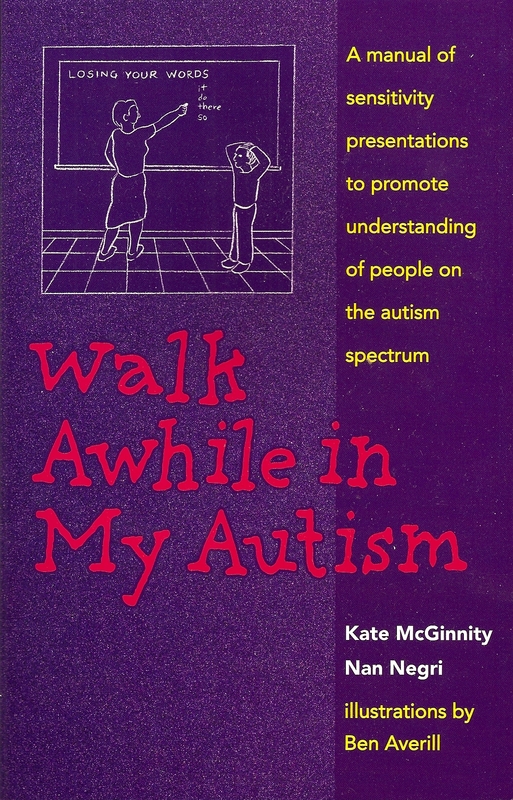 Walk Awhile in My Autism by Kate McGinnity & Nan Negri has been a consistent seller for CBR Press since the book’s publication in 2005. Over 3,500 copies have been sold through workshops and online. We’re pleased to announce that Walk Awhile in My Autism is now available as a Kindle ebook from Amazon.com. “A must for every parent, every professional and every child who lives with autism. Buy it. Read it. Love it.”—Anne M. Donnellan, Ph.D., Director of the University of San Diego Autism Institute, and Professor Emerita, University of Wisconsin-Madison. “I especially liked the quotes from people with autism, Planet Autism, and the visual, auditory and tactile exercises to simulate the sensory problems of people with autism. The main thing is all the exercises people can do so teachers, parents, and others can experience how a person with autism senses and feels the world.”—Temple Grandin, Associate Professor of Animal Science at Colorado State University, and author of Emergence: Labeled Autistic, and Thinking in Pictures.